A little over a year ago I took the plunge and bought myself a quilt. A Cumulus Quilt 350. 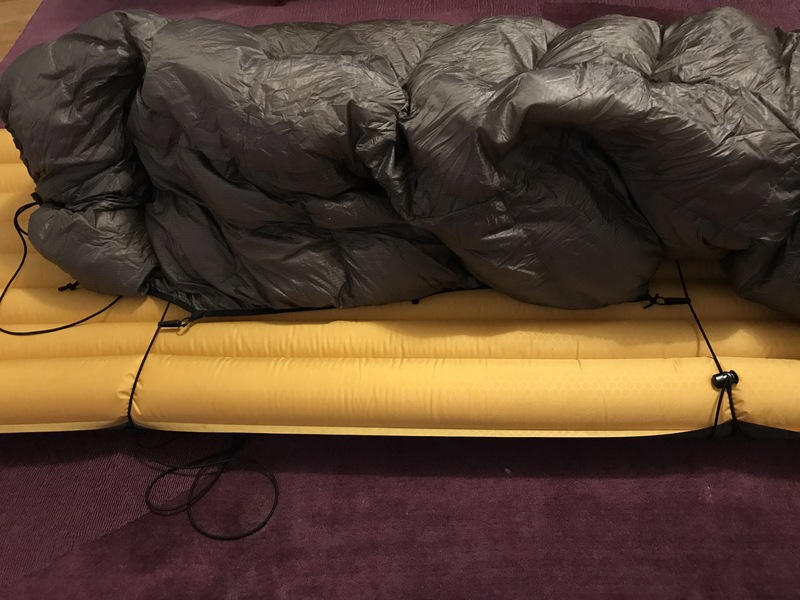 Cumulus is a Polish sleeping bag and quilt maker, that makes high quality gear at an affordable price. For a few extra euros you can get your quilt or sleeping bag with hydrophobic down. I had a hard time deciding on whether to go with a quilt or with a sleeping bag. The main contender was the Cumulus Liteline 400, but eventually I went with the quilt instead and bought it last spring. I already had a Panyam 600 from Cumulus that I really liked. I’ve really tried to like the quilt. 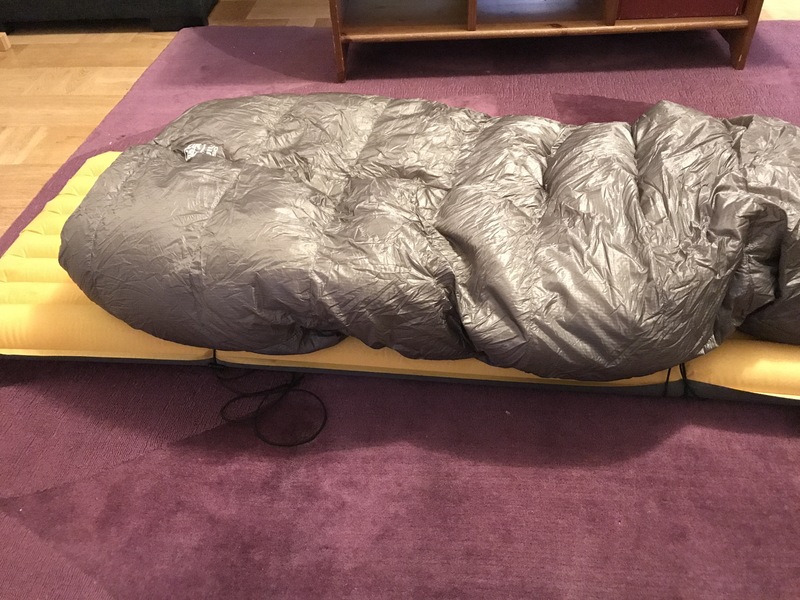 I do like how easy you get in or out of it, by just pushing it down, since there’s no fabric under your back, and it is lighter than a sleeping bag. But I haven’t found a way to get the strap system on the Cumulus quilt to work good, without getting drafts. I toss and turn a lot when I sleep. If I secure the quilt to the sleeping mat the way it’s intended, the quilt follows me when I turn, which leaves me with the gap in the back when I sleep on my side. Every time I turn I have to readjust the quilt. This could also have to do with the quilt being quite narrow. I’ve searched the web for solutions, and I know some people don’t use the straps at all. This is something I’ll try, if my modification doesn’t work as intended. 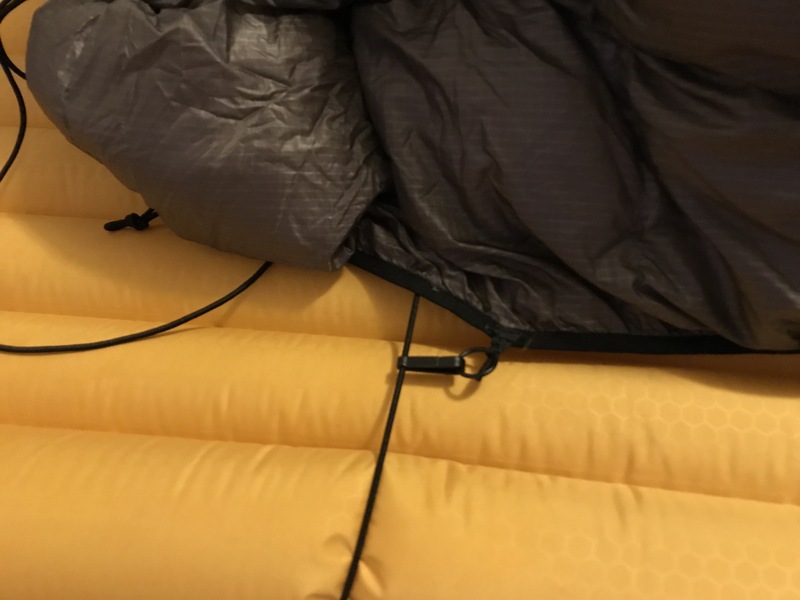 What I did was to untie the shock cord on the quilt, tie rings to the quilt in four places, put mitten hooks on the shock cord and separately strap the shock cord around the sleeping pad and secure the rings on the quilt to the shock cord with the mitten hooks. Kind of a DIY version of the Enlightened Equipment strap system. I can move the mitten hooks closer to the center of the sleeping mat, or out to the sides, depending on how tightly I want the quilt to be. I did these modifications last night, and haven’t tried it outside yet. If it doesn’t work I’ll try it without straps, and if I still keep getting cold drafts I’ll probably buy a Litelite 400 instead. I’ve got the Cumulus Quilt 250, as you know, and regards this as my summer gear. So I basically only use the fastening system at the beginning and the end of the season. Otherwise I don’t use the cord system. I had them on the last hike I did, but they are now removed and I’m ready for the summer. Good luck with your mods! I have the same problem with draft. Did you try the quilt with your hooks? Would love to hear if it works. It’s hard to say if it worked or not since it’s been so warm. But I used it for two nights without feeling chilly. But i do hook the middle straps under the pad, and leave the upper rings unhooked. I’ll try it again when it gets colder and see how it works. But I’m still leaning towards getting a sleeping bag instead.